SAYS SIZE 14 BUT IM A SMALL AND IT FITS WITH A BELT / BIG JUMPER TUCKED IN. Condition is UseD. Black silk CC logo lining. Black and gold CC logo buttons above zipper on back waist - signed Chanel on the reverse. Twisted wool blend yarn with square design. Fully lined and zip and button fastening at back. Twisted yarn. Pencil skirt. Waist: 28". Length waist to hem: 23.5". Fits like a modern size: S UK-10 US-6 EU-38. Leather is soft and supple. Fabric Content: 100% Leather. 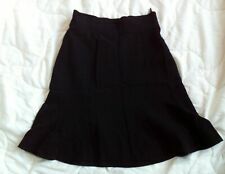 Originally part of a suit, this is a super chic skirt, fully lined. Small vent at back. ZIP AT BACK AND BUTTON TO FASTEN. DIFFICULT TO ESTABLISH EXACT COLOUR – LOOKS LIKE VERY DARK OLIVE OR EVEN BROWN. STITCH TRIM ON FRONT OF SKIRT. THIS SKIRT WOULD LOOK GOOD WITH BOOTS OR OPAQUE TIGHTS AND HEELS. Pattern in red, bottle green and navy blue colours. This can be fixed very easily with a few small stitches however in its current state this does not affect the way the skirt is worn and is unnoticeable to the eye. Size: UK 12 - EU 38. Purple with Black Pattern. Material: 100% Cotton - Lining - 100% acetate. Condition: Very Good Condition. What I expect from you. Label - DOLINA PETITES. classic navy blue & white stripe. patch pockets at bodice - one features a red pocket square. dress buttons through the centre front with gold tone buttons. LENGTH - 113 cms. Earrings are excluded from this for hygiene reasons, unless they are faulty. Beautiful 1960's floral print A line skirt. Waist 28", length 28". Waist stretched maxi 34”. Two pockets to front And two slits to back of skirt. Lined in rayon in a pencil style. Length of skirt 29”. 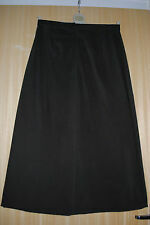 This 25" long 'Outer Edge' Quality Black Leather Skirt has a 10.5" long back Slit. It has the original 'Outer Edge' Label stating Size 18 inside. where I have other leather skirts in smaller sizes. Made of wool and polyester. would suit a UK size 8-10 / EU size 36-38 / US size 4-6 dependant on desired fit. length: 26". button fastening. waist: 14". front and back slits. COLOUR~ Aubergine mix of colours in floral print. DETAILS~ Midi length, elasticated at back of waist band. My mannequin is 180cms tall and a size 10. FABRIC~ Soft cotton feel. ESTIMATED SIZE ~ 10/12. Zipper back with button closure. Suitable for "up-cycling" - suggest dark coloured dye. The item has been dry cleaned. Made in Italy. I believe this may have been hand made. Would fit a size 10-12 modelled on a size 14, I couldn’t do the skirt up at the back lol. Features invisible zip at the back. Beautiful soft silk with piping on hems. Side pockets and gathering on front. Fastens at side with button. Janice Wainwright. Length waist to hem: 23". Waist: 28". mid length. Fits like a modern size: S UK-10 US-6 EU-38. 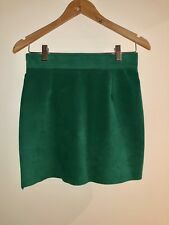 A stunning green précis petite pencil skirt. Size: 14 UK. Zipper back with hook/eye closure. Very chic ensemble piece - can be matched with a colourful sweater, blouse or work jacket/blazer. Made in Italy. Smart heavy calf length pleated skirt. Button fastening down full length. This is a gorgeous fitted pencil skirt, made in narrow panels of lace and satin. It is darted to give shape at the top and has a zip back opening and a slit opening at the hem. In perfect unworn mint condition, it is shown here on a UK size 6-8 mannequin, which is equivilent to a US size 2-4 and Fr34 - Fr36. SupermodelYasmin Le Bon was one of his faces-heading his ad campaigns in 1988 (pics 8 and 9), as well as regularly walking the runway for him. A great classic Pencil Skirt - from LOUIS FERAUD. uk size 12. Slit at back hem has gold button hidden fastening. Pure New Wool and fully lined. Gold button s on slit. Fits like a modern size: S UK-8 US-4 EU-36. Length waist to hem: 23.5". Waist: 26". FISHTAIL PLEAT FEATURE AT CENTRE BACK NEAR TO HEM. LONG STRAIGHT SKIRT. ~ LONG SKIRT ~. Label - HANDMADE. WAIST - 70 cms. LENGTH - 105 cms. FIXED WAISTBAND WITH CENTRE BACK ZIP FASTENING. Wool blend, fully lined with zip fastening. Wool blend. Length waist to hem: 28". Fits like a modern size: S UK-8-10 US-4-6 EU-36-38. Plack, red and blue. Waist: 27". Label - Styled By TOSOL "DAVID". classic black & white stripe in a knit poly/acrylic blend - has small amount of stretch. Material - POLYESTER ACRYLIC. dress buttons through the centre front to just below waist. Waist: 74 cm. -Height: 107 cm. -Chunky Soft Tissue. -Long Wide. Materiale Velluto Liscio. -Size: M-44. MPN Non applicabile. This is a vintage 1990s Ralph Lauren tartan skirt. It’s a size 10. It was purchased from Messina Henbry vintage for £40 but never worn so it has the tag on it. It’s a grey/blue colour and is high waisted. I am from a smoke and pet free home. I will accept offers, so feel free. Colour: Beige. Size: Label size: 38 - UK estimated size: 10. Weight: 450 gr. Condition: Good. Material: Silk. Colour: Purple. Size: Label size: 36 - UK estimated size: M.
This lovely skirt is fantastic for Winter. They have been sourced from the UK and they fit a Size UK 8-10. They are a midi-length and light blue in colour. 40 Flax Woman. -Zip in back needle. -Waist: 66 cm.